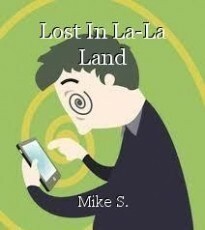 Lost In La-La Land, poem by Mike S.
but there are certain challenges with it that it brings. when there’s so much that’s just presumed – so much I have no clue in! and the messages we are sending are always getting smiles. for once again it seems that I’ve got lost in La-La Land! a sense of panic grips me, and then confusion gets so strong. See, I was born in the technology-dark ages before fire. I see the Jones's up ahead, disappearing into the fog. bound to be stymied by a futile and fruitless pursuit. Frustrated, angry, and exhausted to boot. as into La-La Land, stumbling, bumbling, I sail! Excellent choice of cover, Mike! I think it worked out pretty good, born as it was from that one comment! Thanks, Hully, and I'd agree! This is good, there's alot of truth to be had here. Thank from both of us, J!